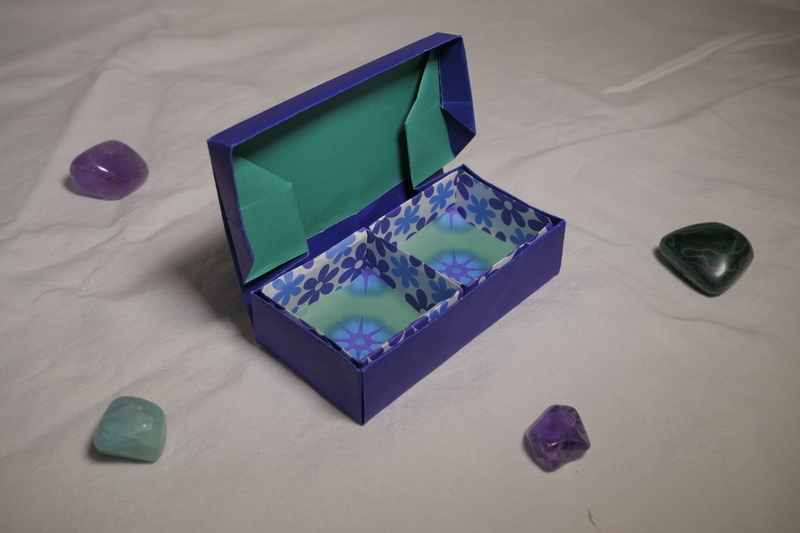 I showed this model before, but as I said, it’s one of my favorites – so here are a few more. On the left, the blue box is made from square chiyogami, 15cm. 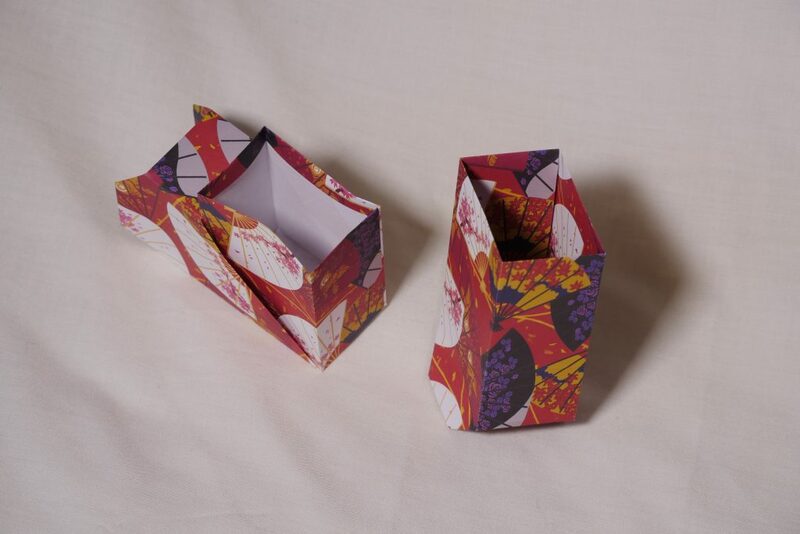 On the right, it’s square 20cm halloween paper by Avenue Mandarine (“Boo!”), same pattern on box and lid but smaller print on the lid. 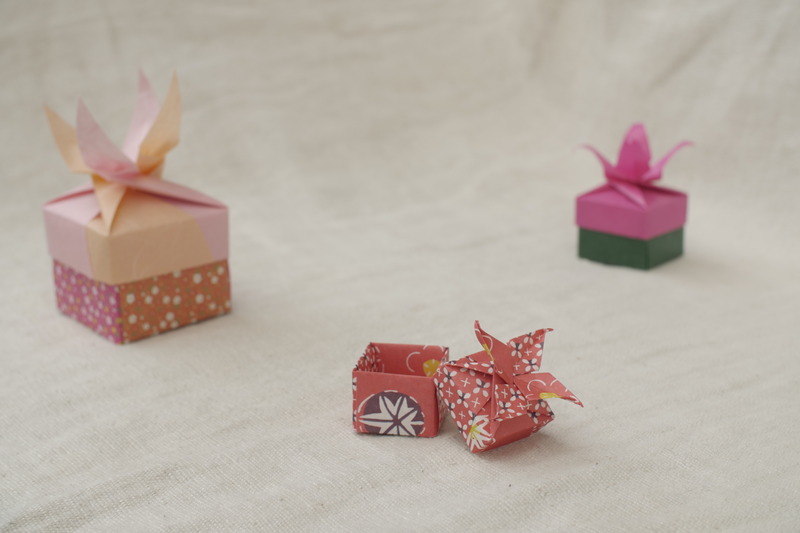 The red and silver box is made from 15cm double-sided paper by Daiso. 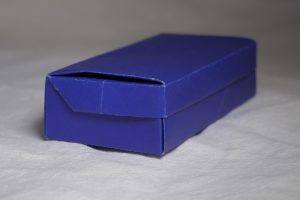 It’s quite thick and I like the texture on the metallic side, makes a sturdy box. The yellow box on the right is 15cm print chiyogami, I think also from Daiso. Details of the flower on the lid. Once again, this box is by Tomoko Fusè. 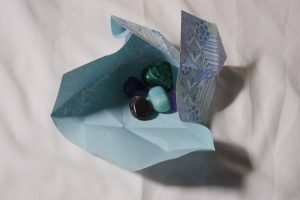 It can be found in a japanese book, ISBN 4480872035, page 8. 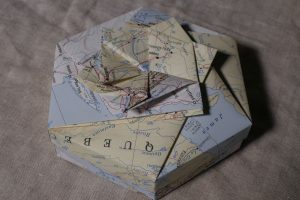 It is folded from one sheet of A4 double-sided cardstock (150g/m²) by Maildor. 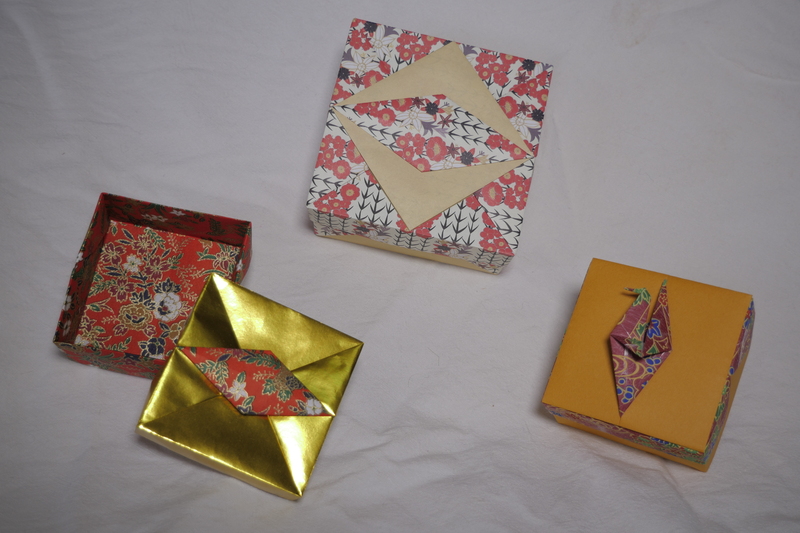 These gorgeous boxes can be found in a japanese book, ISBN 9784416307069, page 66 and further. 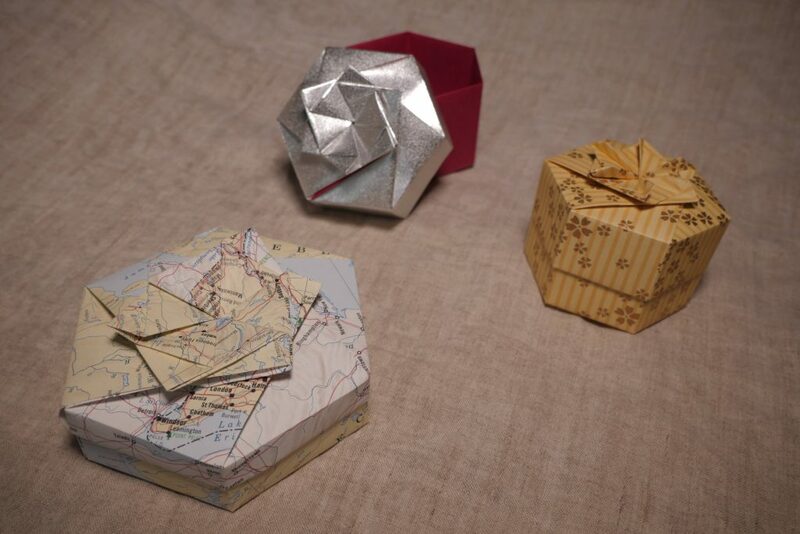 They’re all the same base model, only the decoration part changes. 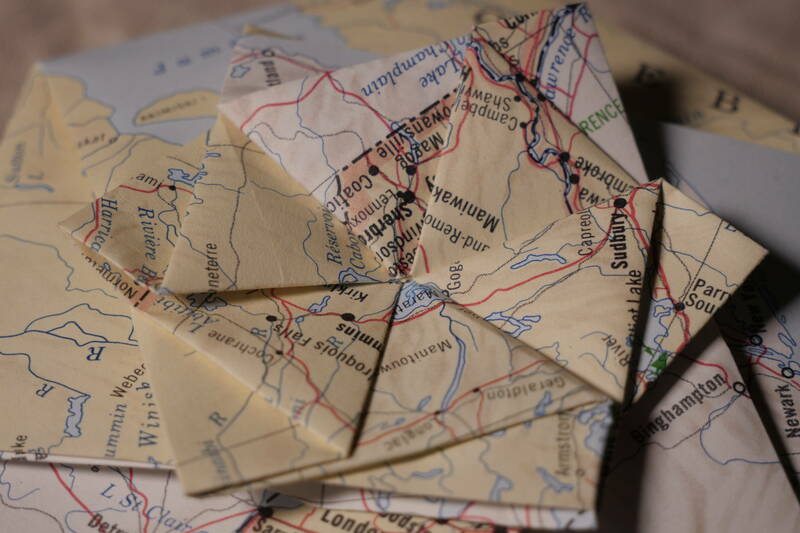 As you can see, I really like this model, and folded a huge serie of them. On the left, folded from japanese washi chiyogami (this one) (two 15 cm sheets on the bottom + a matching 7.5 cm for the decoration) and one sheet of gold foil paper 15 cm for the lid. 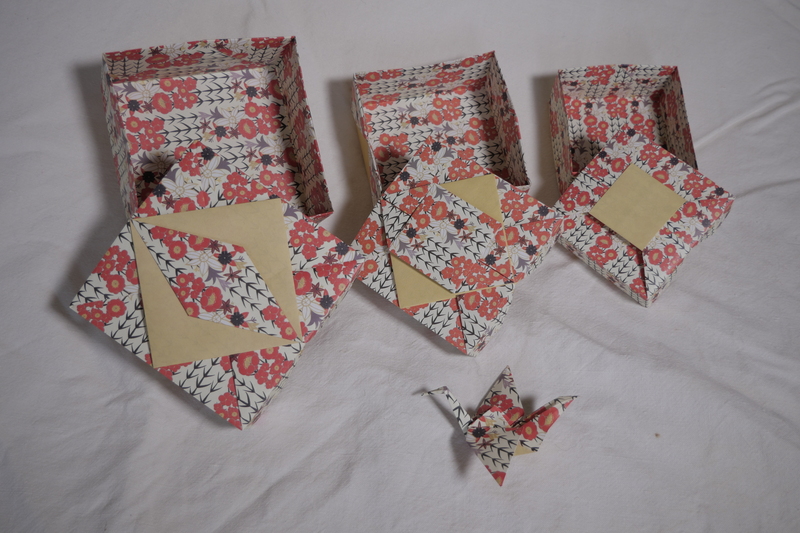 On the right, yellow Tant paper (2 sheets on bottom + 1 under the crane) and another japanese washi chiyogami, one sheet 15 cm for the lid and another for the crane (not sure about the size). 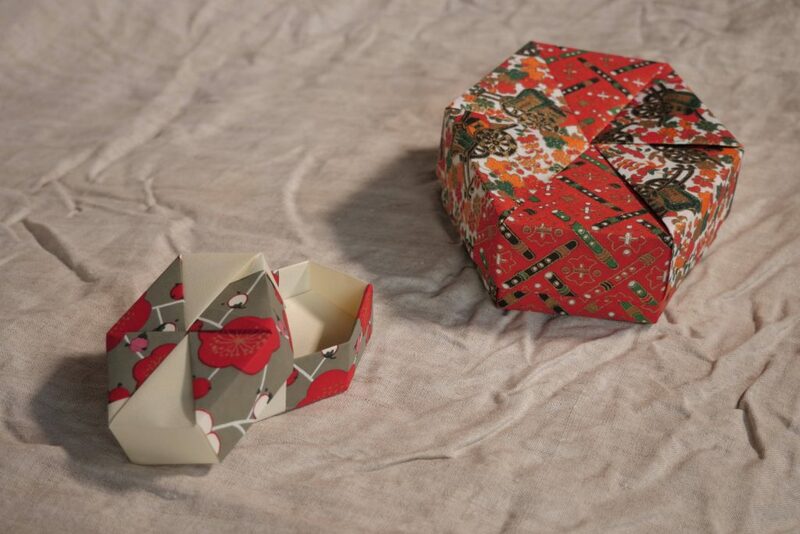 Here you can see I played nesting boxes with different decorations. People loved opening them and discovering the next! 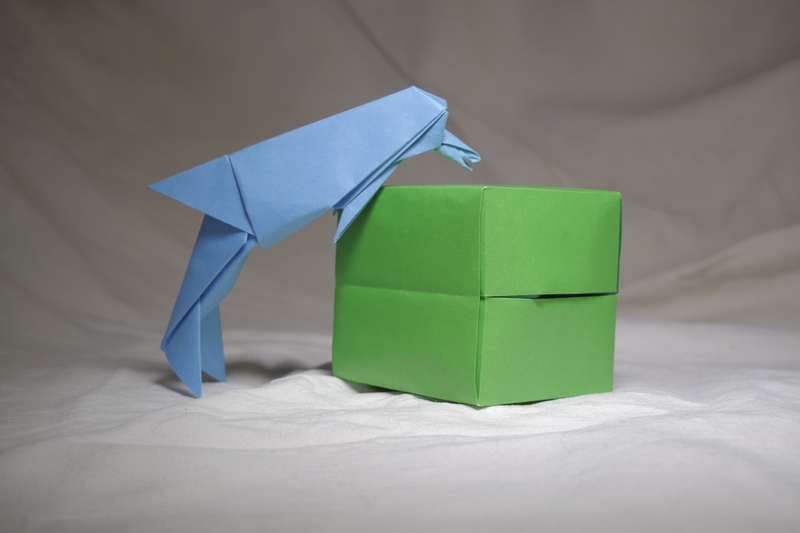 The crane with wide tail is on page 63. 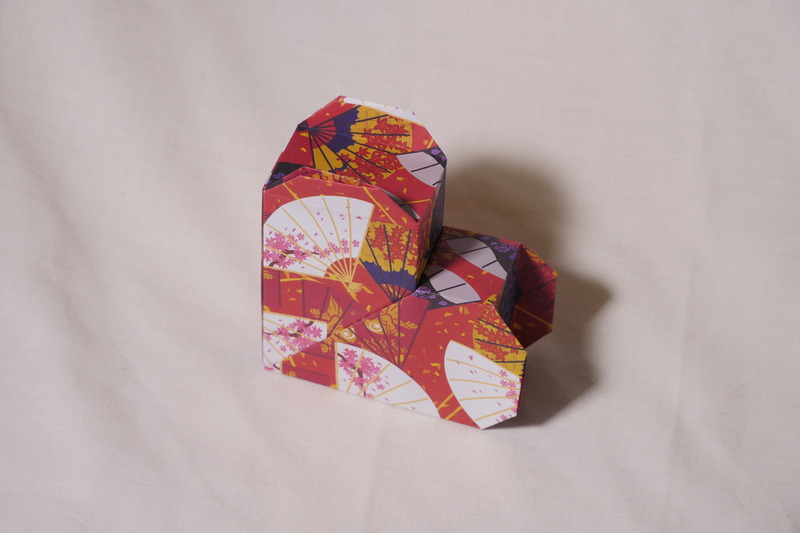 The left box is double-sided chiyogami 15 cm from toyo (a pack of 30 patterns, 120 sheets). I love the little leaves. The paper for the box on the right comes from a nuinui pack again. 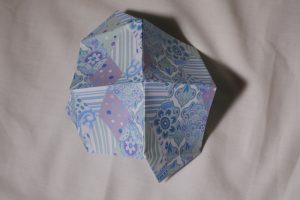 It’s not so clear on the picture, but the decoration is actually a handle on this one. 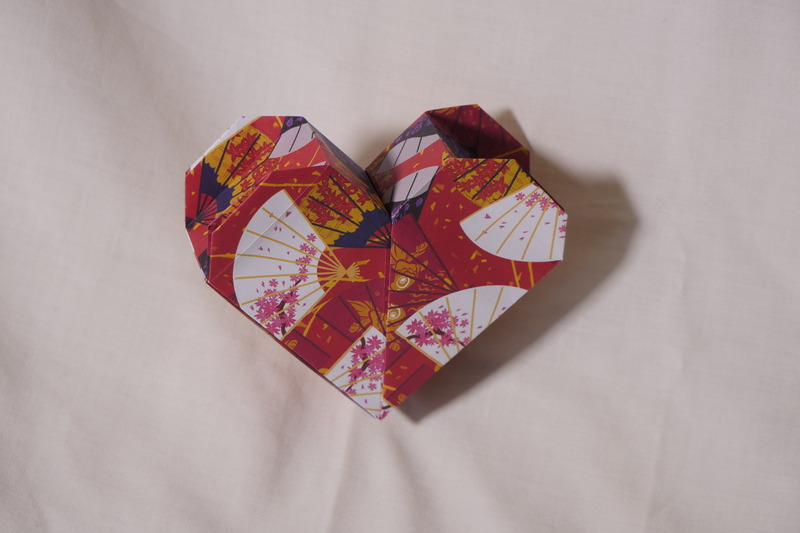 I really, really like this book by Tomoko Fusè. As far as I know, it hasn’t been translated. 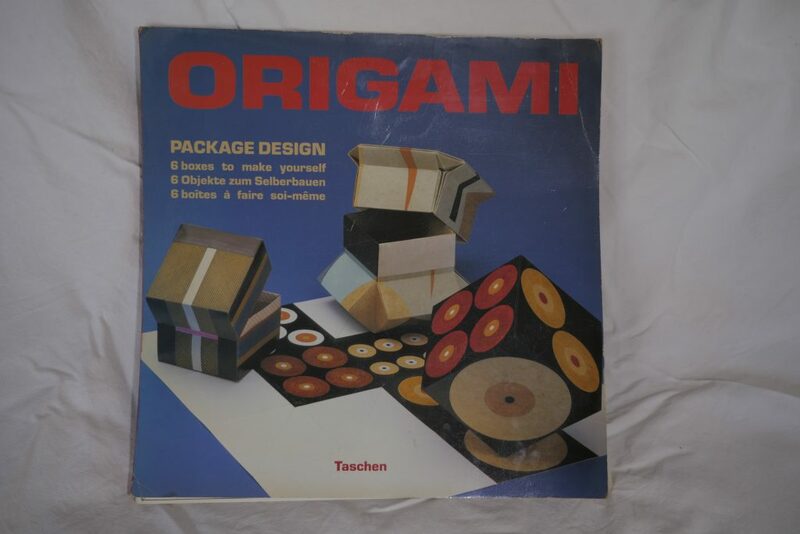 The ISBN is 9784416307052. Square boxes page 84, rectangular page 88. The box on the left is folded from 2 sheets of “back to basics” paper by Dovecraft, theme “baby steps”, 20cm (the paper is 150 gsm cardstock, thin enough to fold but makes strong boxes!). 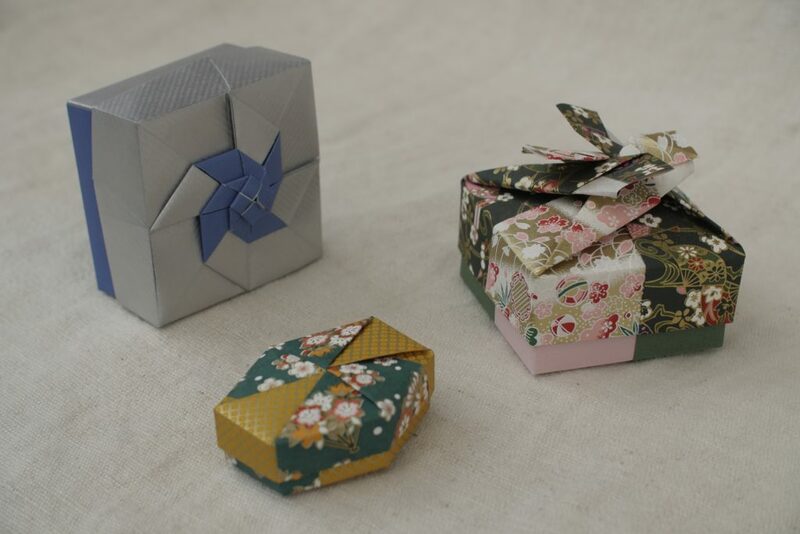 The middle is chiyogami 14cm, the rightmost is “Die Sachenmacher” 20cm. 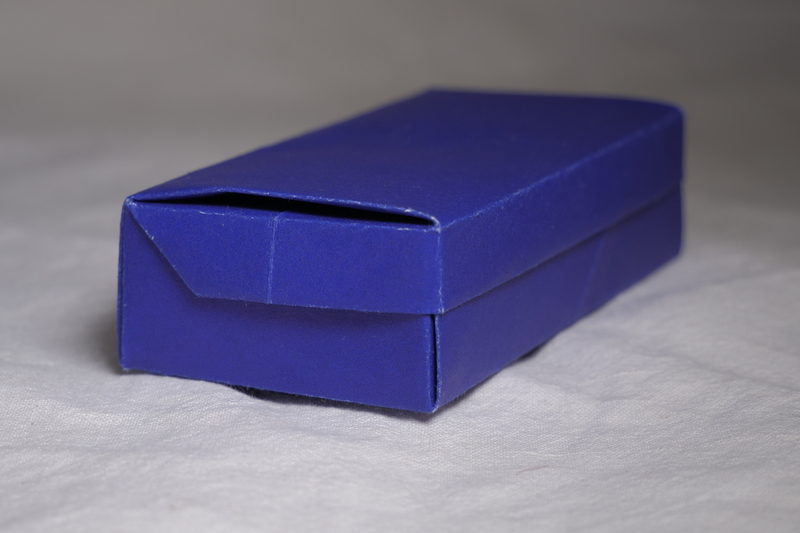 Step 6 of the box, I recommend leaving a 1-2 mm gap to make step 19 easier and cleaner. The box on the left is folded from the same Dovecraft paper as the one on the above photo. The one on the right is japanese yuzen chiyogami 15cm. 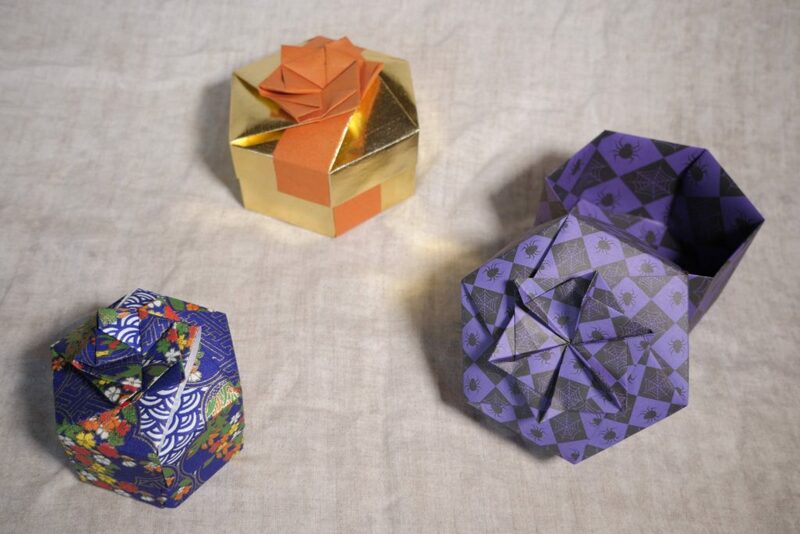 These are various models by Tomoko Fusè. 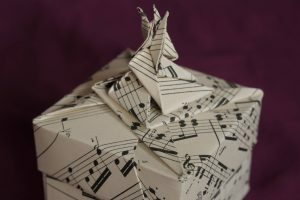 All are made with 8 sheets of square paper (4 for the lid, 4 for the bottom). 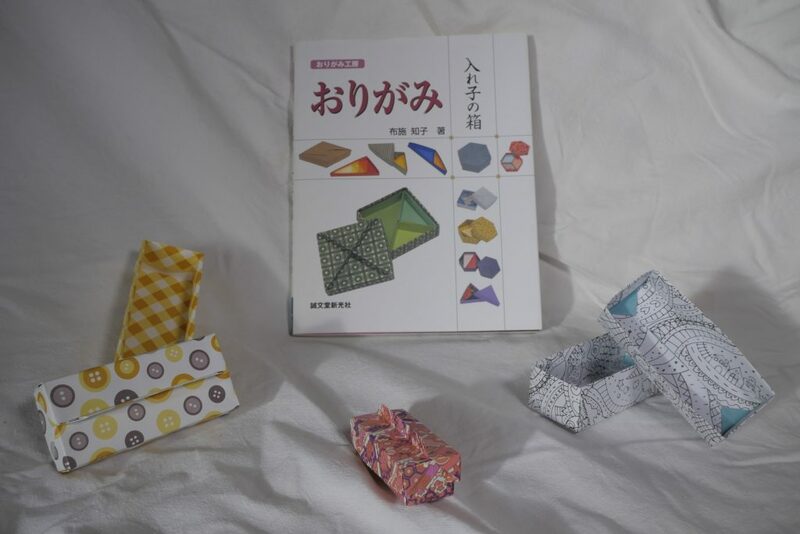 The box on the left is “square box Vortex”, page 62 of “Fabulous Origami Boxes” (Japan Publications Trading Co, ISBN 9780870409783). 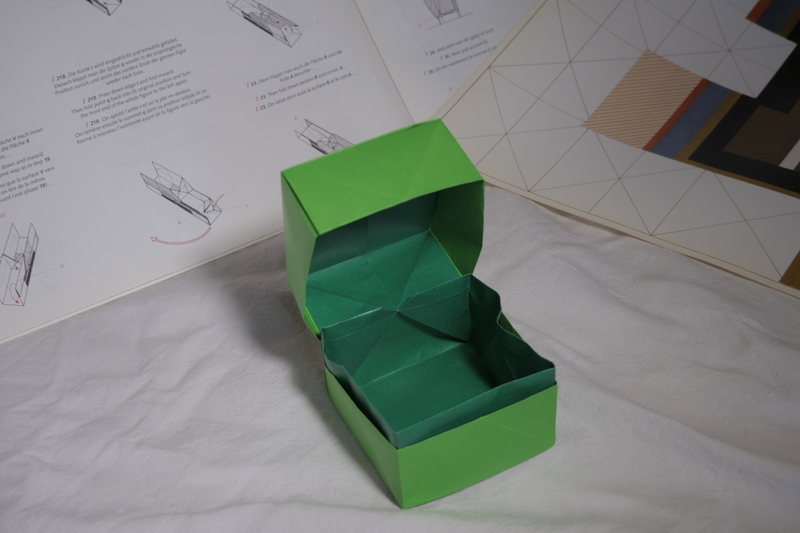 The box in the middle is “shallow hexagonal box”, found page 72 of “30 boîtes en origami”. 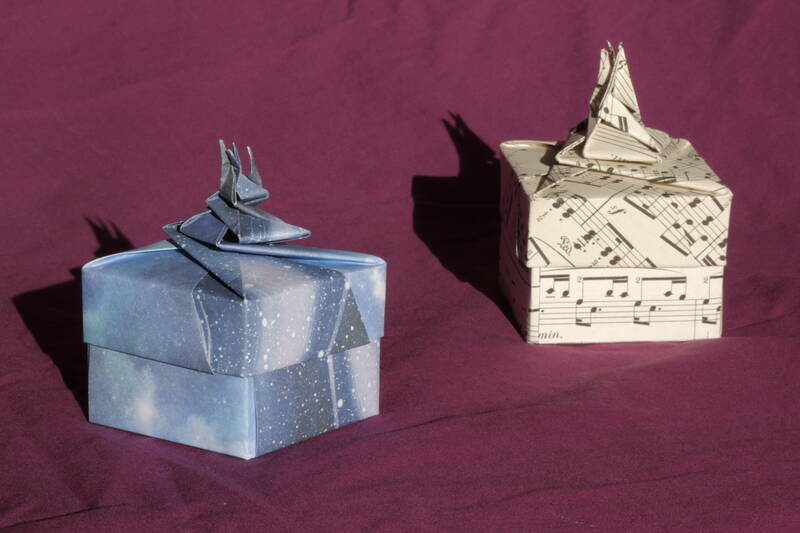 The box on the right is “Square box C”, page 38 of “Joyful Origami Boxes” (Japan Publications, ISBN 0870409743). 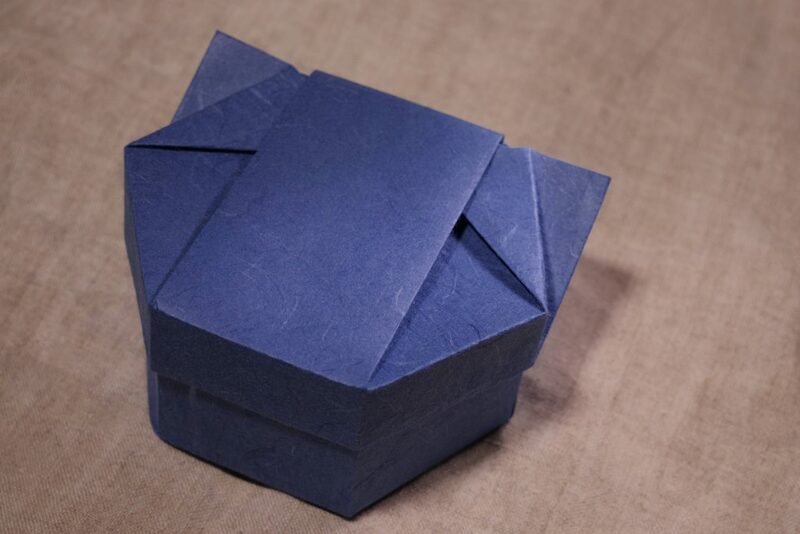 Paper for the rightmost box : japanese chiyogami for the lid, Tant 15 cm for the bottom. 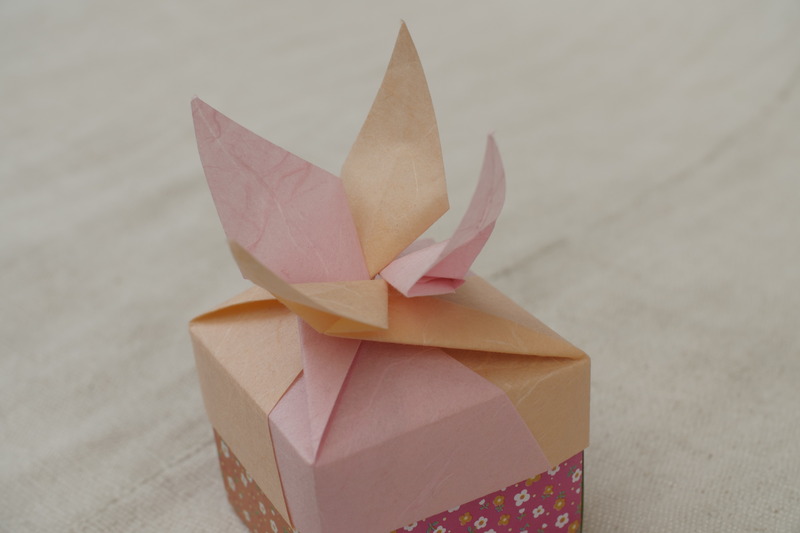 Paper: double-sided 15 cm kraft paper from schoene-papiere.de (sadly they don’t sell anymore at the moment). 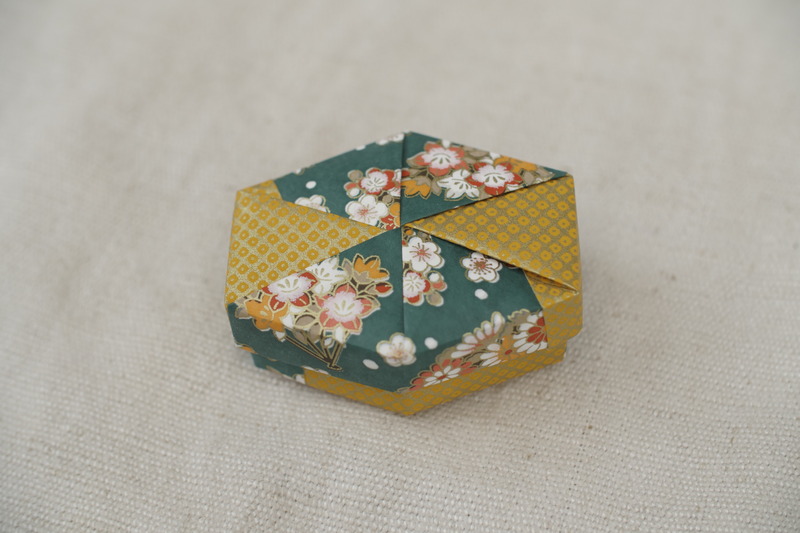 Paper: japanese chiyogami 7.5 cm. 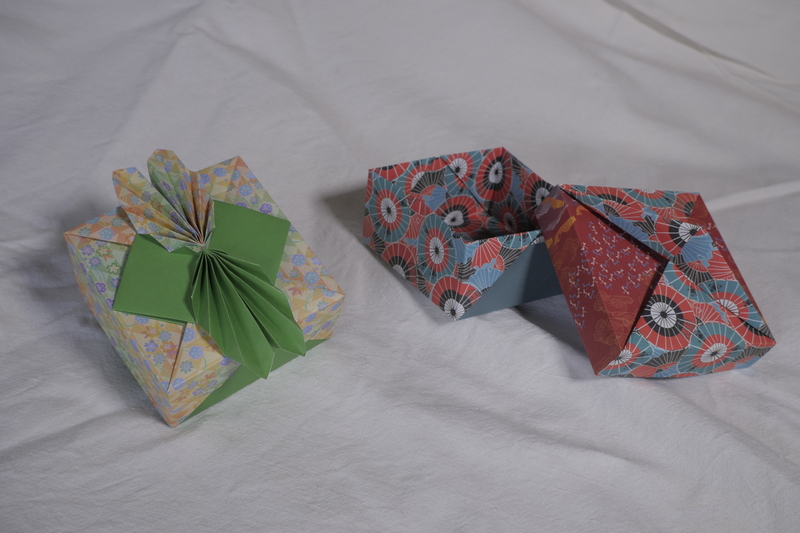 left: japanese chiyogami 7.5 cm + Tant, right: japanese chiyogami 15 cm (the paper is a bit too thin for the size of the box). 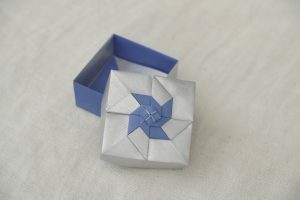 Those are two similar models, found once again in “30 boîtes en origami” (page 48 for the flower box, 52 for the spiral). 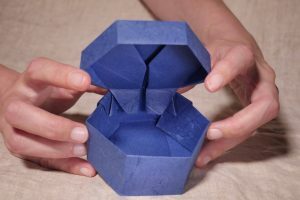 They are made with 8 sheets of square paper, 4 for the bottom and 4 for the lid. The left spiral box is made from Daiso Fabric paper 15 cm. 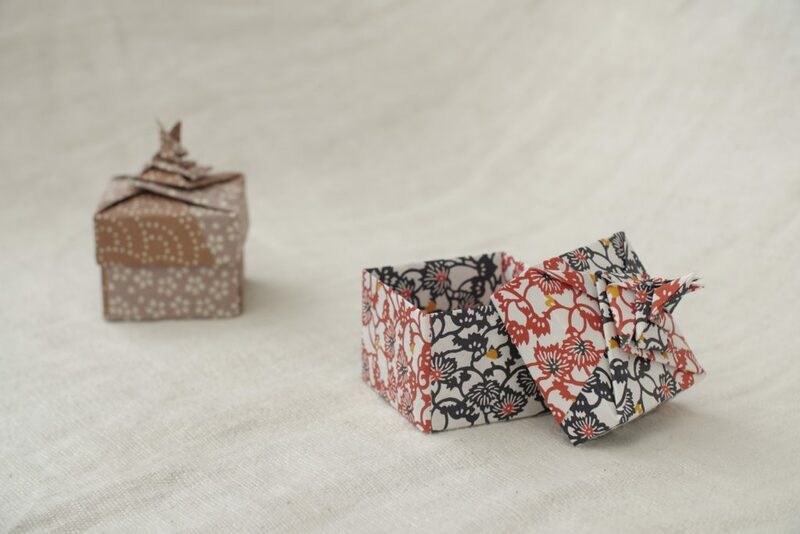 The right box is made from Daiso Yuzen chiyogami paper Vegetation 15 cm. The left box is made with star paper found on eBay, the right box is made from music sheets cut to 15 cm, found on amazon. 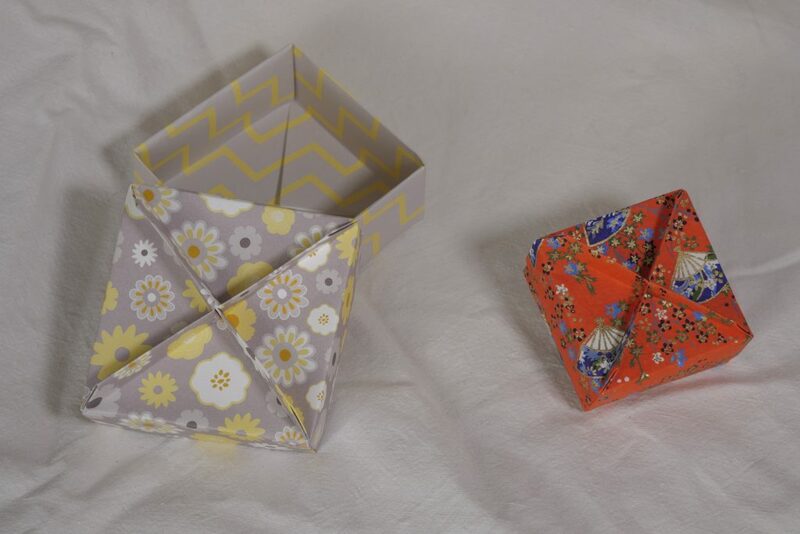 The flower boxes are made from: left, Jong le Nara pattern colored paper flowers for the bottom, Daiso handmade paper Sukigami for the lid, both 15 cm ; right, MarpaJansen glassine paper 10 cm ; middle, Grimmhobby washi chiyogami 7.5 cm (the box is tiny, very cute :)).